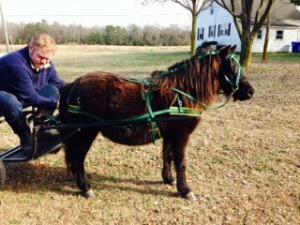 I have always wanted to learn how to drive a miniature horse and cart, and now is the time it’s going to happen! I have found the perfect miniature horse for the farm, her name is Belle. She came from an auction where no one wanted her, and all the more reason to add her to my wonderful little menagerie of miniature farm animals. She didn’t have a name so a friend called her Black Betty, but I think she’s more special than that. She is a little princess and should be named after one! I have a little cart and harness and will be working with Belle over the next few months to teach not only me how to drive her properly but to practice for parties with the little cart. I want to make sure we are ready and safe when we do decide to start the cart rides at parties. We should be ready by summer of 2015, right around the corner. My plan is to decorate the cart to match any theme of the party. For example, I can decorate the cart in Princess, John Deere, My Little Pony, Cowgirl, Cowboy and much, much more! In the mean time, Belle will be joining me at petting zoos for petting and pony parties to give little children pony rides. This is going to be an awesome experience and I am so excited to share this experience with all of you!